Google recently announced two key changes to its search algorithms that will impact the way you search for sites on your mobile device. The first change, which has already taken effect, enables mobile apps to be ranked higher on Google search results pages. Mobile apps that use Google’s App Indexing feature would receive better mobile search page ranks. For now, this feature is exclusive to Android app users signed into the App Indexing service. Both of these updates by Google are designed to increase the accessibility of mobile-friendly content and provide a better search experience for mobile users. Webmasters knew this day was coming for years, and now it’s finally here. Now that Google has announced its mobile search updates, Internet and web-based companies have no excuse not to be prepared. More than ever, people regularly rely on mobile searches—so if your company’s site isn’t fully optimized, it’ll be left behind. Dealerwebb offers responsive web designs that can be viewed on all devices, mobile or otherwise. Google prefers sites that use responsive design, so clients who choose a Dealerwebb site don’t have to worry about reworking them to make them compliant with new browsers. 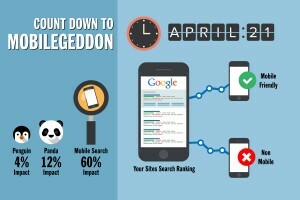 If your site hasn’t been optimized for mobile access by now, then what are you waiting for? Contact Dealerwebb today so we can help you provide your users with an optimized mobile experience! To find out whether your site is mobile friendly, use Google’s Mobile Friendly Test or review their mobile-friendly guidelines.